Here are a few events I’ve been writing about recently on Gapers Block to pique your interest in current and future art events in Chicago. Next time you’re near the Art Institute, meander south to Solti Park at the southeast corner of Jackson and Michigan. 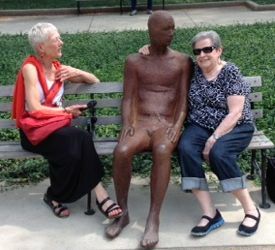 You’ll find these pairs of figures – one iron, one steel – that seem to want to talk to you or make you sit down and reflect. And you can sit down next to one of them and look into his eyes. My friend Linnea and I had a conversation with one of them. The Icelandic artist, Steinunn Thórarinsdóttir, modeled the figures after her oldest son. Read my article. The massive annual art exhibition known as Expo Chicago will return next month with displays from 120 galleries at the Festival Hall at Navy Pier. There will also be contributions from other organizations and a citywide week of arts and culture called Expo Art Week. Included in the week’s activities will be museum and gallery exhibits, music, theater and dance performances. The exhibition is open for public viewing September 20-22. See my Gapers Block story for more info. It may not attract curators and collectors from around the world, but this exhibit September 7-13 at 222 N. DesPlaines St. should be very intriguing. It will show the work of eight local artists, who work in painting, sculpture, found art and video art. Who knows? You may fall in love with a piece of art that you can actually afford to buy. Because the expenses of mounting the show are funded by crowdfunding, the artists will receive 100 percent of any sales at the show. Read about it here. Strange Bedfellows, another one of our creatively crazy storefront theaters, just finished a run of Inventing Van Gogh, an imperfect but intriguing story about Vincent Van Gogh’s rumored last painting, another of his self-portraits. Strange Bedfellows’ motto is “Redefining mischief,” which makes me want to see what their next play promises. See my Inventing Van Gogh review. This 82-minute documentary opens this Friday and runs for a week at AMC Loew’s 600 N Michigan. It repeats the familiar story of US manufacturing’s decline over the last 30-40 years and suggests a rather naïve solution: Buy local, buy American and that will build a new domestic manufacturing base. The story is told with some compelling personal stories and anecdotes about half a dozen businesses, large and small, that changed their practices to survive. Buy local and buy American are practices that some of us can follow. But the big-box stores sell lowest-cost products made overseas and those are the products that many American families can afford. So this film, while well made, is “preaching to the choir.” Read my review. 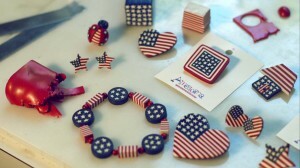 Image of stars and stripes jewelry by Merrily Made Jewelry, courtesy of the producers; see review for the jewelry story.